Definition: If you are "at-fault" for an accident, this means that you caused the accident to take place, either through an act of your own, such as accelerating into another vehicle or by failing to take an action. Whether or not you “meant to” do something, if you are the cause of the accident, you are still at fault. If the insurance company and/or police deem you 51% or more at-fault, then you are considered to have caused the accident. A ticket from a police officer is not required in order to be at-fault according to the insurance company. If you are in a single vehicle accident, it is more likely than not that you are at fault. Although certain types of accidents will have a greater amount of discretion by the insurance company when it comes to assigning fault, there are other types of accidents that are cut-and-dry in terms of liability. Rear-ending another vehicle: Hitting the back of another vehicle is a well-contested topic and with good reason—but the insurance companies do not see it that way. Only in extremely rare circumstances are you not considered at fault if you hit the back of another car. Driving under the influence of drugs and/or alcohol: Other than being illegal, driving under the influence (DUI) will cast considerable doubt on any testimony you give regarding your accident. Since it is such a careless practice, insurance companies and police have an unofficial zero-tolerance policy toward accidents involving drugs or alcohol. Not obeying traffic signals: Blowing a red light is the most obvious way to disobey traffic signals, but there are other common mishaps with usually less serious consequences. Failure to yield when merging into traffic, turning right into the side of a car, and rolling through stop signs are all common examples. Using a cellular phone while driving: The laws are always changing, but if you were hit from a car and can prove the driver was using their phone, it can make the difference if the insurance company is on the fence regarding who is at fault. 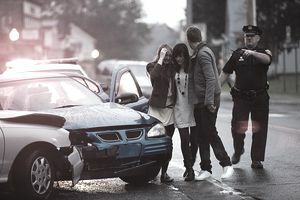 Although often the best way to avoid being at fault is to obey the law and drive safely, there are some instances you cannot control, and the insurance company finds you at fault for an accident that has occurred. When most people discover they are found at fault, they feel a pit in their stomach. This is because insurance companies have a reputation for raising your rates when you commit these type of accidents. But, if leveraged correctly, a previous driving record can stave off a rate hike. Remember to check with your insurance company if your rates are scheduled to rise, as they have a habit of raising rates without prior notice. While accidents are unavoidable—and often the rising rates that accompany them—there are measures you can take to avoid causing an accident. Such tips would be to put your phone away while driving, avoiding the consumption of substances that may impair your ability to drive, and to obey all the legal and safety rules of the road—even if you do not agree with them.